HOUSTON, July 18, 2013 -- Jiffy Lube International, Inc. -- the company that pioneered the fast oil change industry and remains the industry leader in vehicle preventive maintenance -- today announced its second annual campaign in support of the Muscular Dystrophy Association (MDA). As part of its "Muscle Up℠" campaign, Jiffy Lube invites drivers to visit participating Jiffy Lube® service centers between August 1 and September 2, 2013 to raise funds for MDA and help those affected by muscular dystrophy and related neuromuscular diseases. The inaugural "Muscle Up" campaign raised more than $1 million for MDA. This year, with 100 percent of Jiffy Lube franchisees participating in the campaign, the company aims to exceed last year's donations. "We are excited about this year's 'Muscle Up' campaign, raising funds to help the more than one million Americans affected by neuromuscular diseases," said Jeffrey Lack, director of marketing of Jiffy Lube International. "And, I'm extremely proud that we have 100 percent participation with more than 2,000 franchise-owned Jiffy Lube service centers supporting the effort. " The "Muscle Up" campaign emphasizes the parallels between the body's muscles and a vehicle's engine --both require care and maintenance to perform to their fullest potential. Beginning August 1, Jiffy Lube customers can make a $3 donation to MDA through the "Muscle Up" campaign at more than 2,000 participating Jiffy Lube service centers across the country. In return, donors will receive a "Muscle Up" savings book containing more than $100 in Jiffy Lube savings. All funds raised during the month-long campaign will benefit MDA and its programs on both the national and local level. Additionally, an online donation component will help extend the reach of the campaign. For each new fan who "Likes" the Jiffy Lube corporate Facebook page between August 1 and September 2, 2013, Jiffy Lube will donate $1 to MDA (up to $10,000). The Muscular Dystrophy Association is committed to funding research and providing health care services and education to help enhance the lives of those affected by neuromuscular disease. 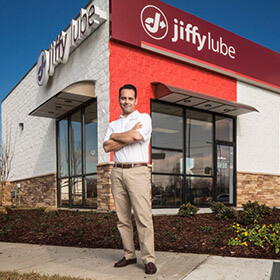 Over the past two years, Jiffy Lube has been working closely with MDA to coordinate the partnership and to connect Jiffy Lube franchisees with their local MDA chapters. In March 2013, MDA National Goodwill Ambassador Bryson Foster, 13, attended the annual Jiffy Lube Convention to share his experiences of living with Duchenne muscular disease and encourage franchisees to support the cause. Recently, Jiffy Lube International staff attended the barrier-free MDA summer camp in the Houston-area, where they spent time interacting with campers. "We're pleased to announce Jiffy Lube as an MDA partner for a second year," said MDA President and CEO Steven M. Derks. "Jiffy Lube franchisees and drivers across the country helped raise critical funds through last year's 'Muscle Up' campaign, which provides vital funds for clinical care, support services and MDA summer camp for the families we serve. With the help of Jiffy Lube's generous franchisees, employees and customers, we will work together to fight back against muscle disease again this summer." The "Muscle Up" campaign is driven by the passionate support of Jiffy Lube franchisees, who are deeply committed to giving back to their communities, as well as the drivers who look to Jiffy Lube for their vehicle preventive maintenance needs. To get involved, visit JiffyLube.com to identify and contact your local Jiffy Lube service center; there, you can also find oil change coupons and promotions for your next visit. For updates on "Muscle Up" and for ways to help rally support from family and friends, please visit www.jiffylube.com/mda, facebook.com/JiffyLube or twitter.com/jiffylube. MDA is the world's leading nonprofit health agency dedicated to finding treatments and cures for muscular dystrophy, ALS and other neuromuscular diseases. It does so by funding breakthrough research, by providing lifesaving support and services, and by rallying communities to fight back --- all of which is made possible by its generous supporters. For more information, visit mda.org and follow us on facebook.com/MDAnational and [@MDAnews]9. Jiffy Lube International Inc. ("Jiffy Lube"), with more than 2,100 franchised service centers in North America, serves approximately 22 million customers each year. Jiffy Lube pioneered the fast oil change industry in 1979 by establishing the first drive-through service bay, providing customers with fast, professional service for their vehicles. Headquartered in Houston, Jiffy Lube is a wholly owned, indirect subsidiary of Shell Oil Company. Visit www.JiffyLube.com to learn more about Jiffy Lube and vehicle care. This press release contains forward-looking statements concerning the financial condition, results of operations and businesses of Royal Dutch Shell. All statements other than statements of historical fact are, or may be deemed to be, forward-looking statements. Forward-looking statements are statements of future expectations that are based on management's current expectations and assumptions and involve known and unknown risks and uncertainties that could cause actual results, performance or events to differ materially from those expressed or implied in these statements. Forward-looking statements include, among other things, statements concerning the potential exposure of Royal Dutch Shell to market risks and statements expressing management's expectations, beliefs, estimates, forecasts, projections and assumptions. These forward-looking statements are identified by their use of terms and phrases such as ''anticipate'', ''believe'', ''could'', ''estimate'', ''expect'', ''goals'', ''intend'', ''may'', ''objectives'', ''outlook'', ''plan'', ''probably'', ''project'', ''risks'', ''seek'', ''should'', ''target'', ''will'' and similar terms and phrases. There are a number of factors that could affect the future operations of Royal Dutch Shell and could cause those results to differ materially from those expressed in the forward-looking statements included in this press release, including (without limitation): (a) price fluctuations in crude oil and natural gas; (b) changes in demand for Shell's products; (c) currency fluctuations; (d) drilling and production results; (e) reserves estimates; (f) loss of market share and industry competition; (g) environmental and physical risks; (h) risks associated with the identification of suitable potential acquisition properties and targets, and successful negotiation and completion of such transactions; (i) the risk of doing business in developing countries and countries subject to international sanctions; (j) legislative, fiscal and regulatory developments including regulatory measures addressing climate change; (k) economic and financial market conditions in various countries and regions; (l) political risks, including the risks of expropriation and renegotiation of the terms of contracts with governmental entities, delays or advancements in the approval of projects and delays in the reimbursement for shared costs; and (m) changes in trading conditions. All forward-looking statements contained in this press release are expressly qualified in their entirety by the cautionary statements contained or referred to in this section. Readers should not place undue reliance on forward-looking statements. Additional factors that may affect future results are contained in Royal Dutch Shell's 20-F for the year ended December 31, 2012 (available at www.shell.com/investor and www.sec.gov). These factors also should be considered by the reader. Each forward-looking statement speaks only as of the date of this press release, July 18, 2013. Neither Royal Dutch Shell nor any of its subsidiaries undertake any obligation to publicly update or revise any forward-looking statement as a result of new information, future events or other information. In light of these risks, results could differ materially from those stated, implied or inferred from the forward-looking statements contained in this press release.